Last year IPO asked industry stakeholders to offer suggestions regarding redeployment. IIUSA has now followed up with a Memo to USCIS on Redeployment Policy. The memo points out again why the redeployment policy should not even exist, since neither statute nor regulation nor precedent supports a requirement to redeploy EB-5 investment into additional business activity after the job creation requirement has already been met and funds have been returned to the NCE. The memo goes on to make the case that if USCIS still persists in requiring redeployment, the options for redeployment investment should not be arbitrarily limited. I hope that IPO will, as promised, give serious consideration to this reasonable feedback. The redeployment problem is bound up with the material change problem, which is why I’m looking forward to a free Material Change Seminar to be hosted by Carolyn Lee on April 17th, 2019 at 2:00 – 3:00PM Eastern. E-mail to reserve a spot and send advance questions. That “decline in demand” refers to “fewer applicants proceeding to final action on their cases at consular posts abroad and USCIS Offices.” The queue of applicants has not reduced in length (probably), but it has advanced to final action more slowly than expected – delayed by the government shutdown and lapse in regional center program authorization. So what does this mean? For most Indians awaiting a visa number, possibly not much. The key question is not “in which month will retrogression occur” so much as “can I get my visa number before retrogression occurs?” That second question depends on the length of the queue in front of the petitioner (which probably hasn’t changed) more than the specific date for running out of visas (which may be later than expected due to slower-than-expected processing). For Indians who will adjust status, a later Visa Bulletin could at least have the benefit of maximizing the window to at least file I-485 (thus opening the combo card option in advance of visa availability). I created a model that divides inventory of pending I-526 petitions by completion rates, and concludes that processing times should be falling as inventory falls. 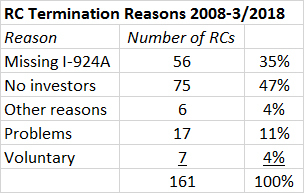 However, the USCIS processing times report indicates that I-526 times are getting longer, even as IPO has fewer and fewer petitions to process. Why is this so? IPO’s secret, I gather, is to introduce an unofficial new step to the EB-5 process: the comprehensive I-526 RFE. Officially, Form I-526 foresees how funds will be spent and how jobs will be created, while Form I-829 demonstrates how funds were spent and how jobs were created. Officially, a Request for Evidence on the Form I-526 asks questions about the original submission and clarifies eligibility at the time of filing. In practice, IPO has been issuing I-526 RFEs that do not only or primarily question the original submission, but basically ask the petitioner to submit an updated collection of I-526 evidence plus prematurely provide I-829-stage evidence for actual past expenditures and job creation. IPO is adjudicating the I-526 one to two years after it was filed, and the adjudicator is naturally curious about the current status and progress of the project. I-526 business plans are dusty by the time adjudicators finally review them, while payroll records may be available by that time. But the adjudication delay is not the petitioner’s fault, and does not change I-526 eligibility or evidentiary requirements. It’s not right to make a habit of using RFEs as a surreptitious new “Form I-526-B” that calls on petitioners to redo and resubmit original I-526 documents with no fault but age, and prematurely satisfy I-829 requirements at the I-526 stage. Apparently there’s some discussion in Washington about visa numbers, and leadership upsets throughout DHS. We shall see what changes actually occur, and whether they affect EB-5. Nothing is changing at the moment. The EB-5 modernization regulation is still pending review at OMB, the Visa Bulletin is still current for India and moving forward for China and India, IPO remains silent, and there are no hints of EB-5 legislation. But for the sake of being prepared, this post considers “what if” questions related to possible forthcoming changes. Vietnam: Final action date was expected to move about three weeks per month between January and May 2019, and progress at least to September 2016 this fiscal year. India: Will get a final action date when visas available to India for the year have been used up, likely “no later than July 2019.” The final action date will initially be the same as for China, to effectively stop visa issuance to India-born for the fiscal year. When FY2020 starts in October 2019, the final action date for India will move forward enough to release enough Indian applicants to claim the new year’s visas. The final action date will likely be in 2017 at that time. IIUSA recently announced that Charles Oppenheim of Department of State will speak at the Advocacy Conference on May 6. We look forward to hearing his updated projections. Regarding regulations, the final rule for the EB-5 Modernization Regulation RIN: 1615-AC07 could be published as early as tomorrow or as late as never, and take effect 30 or so days after publication. We don’t yet know the content of the final rule, but there’s a fair chance that it will be similar to the proposed rule (NPRM) from January 2017 (full text here). If the regulation gets finalized with content that mirrors the NPRM, then here are some issues and considerations to keep in mind. Proposed change: The minimum EB-5 investment will increase significantly for TEA and non-TEA investments (the NPRM proposed $1.8M and $1.35M). The incentive to invest in a TEA will likely be reduced (the NPRM proposed 25% discount instead of 50% discount from the standard investment amount). Many fewer urban areas will qualify as TEAs, due to limits on TEAs that combine census tracts. USCIS, rather than states, will become responsible for TEA designation. Prospective investors: If I were planning an EB-5 investment, I’d make every effort to get I-526 filed soon under the current lower investment threshold. In vetting potential projects, I’d consider how much EB-5 money the project still needs to raise (the larger the EB-5 raise, the more exposure to risk from rules changing for future investors). Project companies and regional centers: If I were promoting an EB-5 investment, I’d try to complete the raise asap, before new rules constrict the market. Meanwhile, I’d strategize about what can work under the new rules. It seems likely that a dramatic investment amount increase, combined with reduced and restricted TEA incentive, will create an environment that privileges high-end projects with attractive ROI. Some people can afford to write off $500,000, but an investor committing $1-$2 million of equity will likely care about it as an investment, not just an immigration opportunity. The ideal project will offer security, a solid return, and be located in a distressed or rural area. Since economic reality makes such opportunities very rare, security and profitability will probably carry the day. Sadly, the NPRM proposed to make TEA status both more difficult to obtain and less valuable – not a recipe for competitive advantage for distressed and rural areas. But for what the revised TEA incentive is worth, it’s possible check whether a given project would qualify. The revised TEA designation rules in the NPRM are basically the same as the current rules, except when it comes to making a TEA from census tracts. Look at a mapping tool that shows unemployment rates by census tract (this one for example). A project can qualify under new rules if the census tract where it’s located (combined, if needed, in a weighted average with one or more of the immediately contiguous census tracts) has high unemployment. The difference from current practice is that a special TEA as defined in the NPRM can only include census tracts that touch the tract where the project is located, not larger and more extended groupings. Proposed change: An EB–5 immigrant petitioner may to use the priority date of an approved EB–5 immigrant petition for any subsequently filed EB–5 immigrant petition. This provision would provide some protection from material change, allowing the investor to keep her priority date even if changed circumstances require filing a new I-526 petition. Effect: The NPRM proposed that priority date retention would specifically apply to anyone in the stage between I-526 approval and conditional green card. The NPRM does not offer the protection to people with pending I-526, people whose I-526 was denied or revoked, or people who already have conditional permanent residence. Prospective investors: This change is promising – an additional future protection that’s particularly important to anyone from oversubscribed countries (China, Vietnam, India) who faces a long wait between I-526 approval and green card. People with approved I-526 and still waiting for a green card: The priority date retention could be a game-changer. It means that so far as USCIS is concerned, you’re free and welcome to withdraw from one project and invest or reinvest in another. At this stage you’d still have to file a new I-526 for changed circumstances (and deal with the rules that apply to new I-526 filings), but could keep the original I-526 priority date, and original place in the visa wait line. Priority date retention removes some of the sting from material change, and opens the door for investor-lead redeployment. USCIS can’t force terminated regional centers or under-performing projects give investor money back. But at least the regulation removes barriers on the immigration side to change and voluntary reinvestment. People with conditional permanent residence: The priority date retention does not apply to them, in the NPRM. However, note that EB-5 policy already allows significant leeway for change during the CPR period without need to refile I-526. Project companies and regional centers: For underperforming projects, priority date retention could lead to a rush of investors pushing to withdraw so that they can reinvest somewhere else. For attractive projects, priority date retention could open a new market: people with approved I-526 who need a new investment after the original one didn’t satisfy. Priority date protection could effectively create a secondary market in EB-5 investment, and entirely change the redeployment issue by giving investors power to reinvest their own funds. But there’s an important limiting factor: priority date is all that investors could retain from the original I-526 filing. The NPRM does not offer to let people reinvest under the same rules for minimum investment and TEAs that applied to the original I-526 filing. People who could invest $500,000 in Project A last year may be practically unable to invest $1.35 million in Project B this year, even if USCIS allows and facilitates withdrawing from Project A and reinvesting in Project B. But still, priority date protection could have significant implications for the EB-5 landscape. So far as I can tell, the proposed I-829 changes are an unmixed good. The NPRM would make people more free to grow up, marry, divorce, and die, knowing that family members will still be able to file I-829 to remove conditions. CPR status would be automatically extended between I-829 receipt and adjudication, blunting the pain of long processing times. Interviews would be conducted within reason as to time, place, and content. And now the waiting game, to see whether EB-5 regulations ever get finalized, and if so which provisions get included in the final rule. Congress, if only you would act instead, and provide the modernization that EB-5 really needs to protect integrity and incentivize economic development! The Office of Management and Budget List of Regulatory Actions Currently Under Review shows that the EB-5 Modernization Regulation advanced on Friday to the OMB Review stage. OMB Review is the last step in the rulemaking process before publication of a final rule. 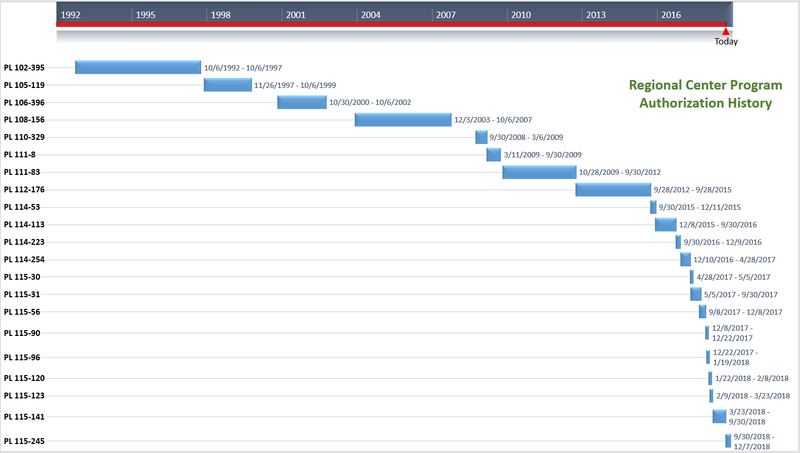 How long does OMB review take? It usually takes many months, as evidenced by other DHS regulations currently listed on the OMB site with receipt dates as early as June 2018, and still with “Pending Review status.” Or it occasionally happens in as little as a month, I’ve noted in my time tracking the OMB site. The regional center program authorization granted in 2018 is now active again, with another continuing resolution that extends previous funding and authorities for a few more weeks — through February 15, 2019. USCIS has updated its Regional Center program page to remove the language about lapse in authorization. My Washington Updates page has the detail on the legislation. The shutdown from December 22 to January 25 turned out to be much gentler on EB-5 than it could’ve been, thanks to the USCIS decision to continue to accept regional center I-526 and I-485 filings during the lapse in RC program authorization. Adjudications were delayed, but not that much in the scheme of long processing times. So we survived the lapse and are reauthorized again, and the drama is just beginning. Regional center program authorization got extended by default in the continuing resolution, and has to be included on purpose in a new funding bill for 2019. And immigration issues are at the center of appropriations negotiations. The White House says “Once the government is open and the immediate crisis is addressed, President Trump will hold weekly bipartisan meetings to reform our immigration system.” A group of 17 Congressional representatives has been appointed to work out a compromise on border security funding – a compromise that could implicate wider immigration issues and visa allocation. The White House statement mentioned these priority issues: “interior enforcement, asylum reform, worksite verification, the 11 million people living in the country unlawfully, and moving toward a merit-based immigration system.” If only someone would speak up in this negotiation for the EB-5 regional center program, and the need to put immigrant investment on a stable footing (ideally with more visas for these merit-full immigrants). But I’m not sure who in that group of 17 negotiators is a friend of EB-5. I hope that the group includes someone who knows positive stories to balance member Patrick Leahy, whose wounds from Vermont Regional Center disappointments are still fresh. Leahy used strong language to complain in 2018 that “The recently-passed omnibus spending bill included a clean extension of EB-5, and did not include any reforms to crack down on well-documented fraud, abuse and national security concerns.” The EB-5 regulations that Leahy called for then have still not been finalized (I keep checking the OMB site for evidence that they’re under review, but nothing yet). Will Leahy or others in Congress be motivated by DHS delay to address EB-5 again now? But then the border security negotiation is so large and EB-5 is such a tiny visa category. EB-5’s problems are dwarfed by the size of the program’s positive economic impact, and negligible in the big picture of immigration problems. When Congress can’t manage progress on a single major pressing issue – border security – how likely is it that the minor regional center program will earn a moment’s thought now, beyond the minimum necessary to keep the program going? We shall see. IIUSA says that it is “active on Capitol Hill and will continue to visit offices and advocate on your behalf. As we learn more leading up to the next sunset date of February 15, we will keep you informed of progress made on a long-term reauthorization of the Program.” We certainly need such advocacy now. In other news, a thank you to industry colleagues for recognizing me again this year as one of the Top 5 Business Plan Writers in EB-5. Blogging is a sideline but business plans are my profession, and I’m delighted to be honored by peers for excellence in my core work. At this time, scheduled passport and visa services in the United States and at our U.S. Embassies and Consulates overseas will continue during the lapse in appropriations as the situation permits. We will not update this website until full operations resume, with the exception of urgent safety and security information. The National Visa Center, National Passport Information Center, and Kentucky Consular Center will still accept telephone calls and inquiries from the public. Please note we will be closed for scheduled federal holidays on December 24 and 25 and will reopen on December 26. The regional center program would lapse for the duration of the partial government shutdown, until a bill reauthorizes the RC program. During this lapse period, it’s likely that (1) any incoming regional center-associated I-526 and I-924 will be rejected, (2) no action will be taken on regional-center associated I-526 and I-924 already pending at USCIS, (3) adjudication will probably continue as usual for all I-829 petitions, (4) no regional-center based visas will be issued overseas, and no final action taken on adjustment of status cases involving regional center investment. Action can begin again as usual for all these petitions and visas as soon as a bill passes that renews regional center program authorization. The EB-5 program itself is permanent program with no sunset date — only the regional center portion of EB-5 is subject to reauthorization. Petitions for investors without regional center sponsors (“direct EB-5”) are not affected by a lapse in RC program authorization. USCIS is a fee-for-service agency not dependent on DHS funding, so IPO could remain open for business as usual and keep working on direct EB-5 and I-829 even during a shutdown. But the Administration could choose to shut down USCIS operations to make a point. So far, there’s just a White House Executive Order that all federal departments and agencies will be closed Monday December 24. This may be an innocent Christmas Eve gift. US Customs and Border Protection is deemed essential to national security and so will probably also keep operating during a shutdown. But travelers with any visa type should note that consular operations may be affected, and interviews may be may not be available. Meanwhile, no evidence yet of action on the EB-5 Modernization regulation. In less good news, State Dept. Can Still Count Relatives Toward EB-5 Visa Cap. The following excerpts from the Law360 article tell the story. The busiest people in EB-5 now may be ambulance chasers looking to exploit the disappointment of backlogged EB-5 investors from China. Chinese investors – don’t get burned twice! If you wish now that you’d known more before putting money in a project, take the lesson to know more before putting money into litigation. Examine (1) does my counsel know EB-5 well enough to make accurate claims that could possibly win my case, and (2) what’s the best I could get out of the case, if I win? The hot button retrogression/redeployment issue has a particularly complex history and factors, so be smart. Otherwise money gets spent on claims like this “Defendants were fully aware when they solicited investments from plaintiffs in 2014 and 2015 that plaintiffs’ capital would need to be reinvested into a different project beyond the term of the partnership’s initial investment.” In fact, a project redeployment requirement was not suggested until August 10, 2015 (in a draft memo never finalized), was not instituted as policy until July 14, 2017, and has not been clarified to this day. Homework needs to be done. This blog, which has a record of EB-5 updates from 2010 to the present, provides one textbook. The SEC announces Three Developers Settle Charges of Fraudulent EB-5 Offering (December 12, 2018). In this tidy case, the developers allegedly told investors that funds would be used exclusively for one real estate project, and then in fact used some funds for purchases at two other unrelated real estate projects. No personal yachts or condos involved here, but transferring funds from one valid project to another valid project is still wrong if not properly disclosed to investors. The developers agreed to settle the case by paying back all the investors’ money, with a penalty. My post from September Preparing to file I-924A Annual Certification has resources for the I-924A, which is due from all regional centers by December 29. I’ve copied below the policy alert and the new policy language. As usual, I also made a new file for the current 6 USCIS PM G (saved in this folder), and performed document comparison with the previous version (dated August 24, 2018) to confirm that nothing changed besides the one new subsection under 6 USCIS PM G(2)A(2). Visit the Policy Manual for Comment page for more information on stakeholder review and comment. The following table describes certain characteristics that might be present in agreements and explains whether their inclusion creates an impermissible debt arrangement. Type of Provision Description Impermissible Agreement? Mandatory redemptions Arrangements that require the new commercial enterprise to redeem all or a portion of the petitioner’s equity at a specified time or upon the occurrence of a specified event (for example, once the conditions are removed on the petitioner’s permanent resident status) and for a specified price (whether fixed or subject to a specified formula). USCIS considers this an impermissible debt arrangement. Such impermissible obligations are not subject to the discretion of the new commercial enterprise (although it may have some discretion regarding the timing and manner in which the redemption is performed). Options exercisable by the investor Arrangements that grant the petitioner the option to require the new commercial enterprise to redeem all or a portion of his or her equity at a specified time or upon the occurrence of a specified event (for example, once the conditions are removed on the petitioner’s permanent resident status) and for a specified price (whether fixed or subject to a specified formula). USCIS considers this an impermissible debt arrangement. Option exercisable by the new commercial enterprise A redemption agreement between the immigrant investor and the new commercial enterprise that does not provide the investor with a right to repayment. However, such an option may be impermissible if there is evidence the parties construct it in a manner that effectively converts it to a mandatory redemption or an option exercisable by the investor (considered a debt arrangement). For example, an arrangement would be impermissible if ancillary provisions or agreements obligate the new commercial enterprise to either (a) exercise the option (at a specified time, upon the occurrence of a specified event, or at the request of the investor) or (b) if it chooses not to exercise the option, liquidate the assets and refund the investor a specific amount. I read and log all Administrative Appeals Office decisions on EB-5 appeals, in an effort to keep up with EB-5 adjudication trends and be more than just another business plan writer with an English major and MBA. The AAO decisions illuminate and very occasionally question current thinking at USCIS about how to interpret and apply EB-5 requirements in practice. AAO found fault with the USCIS analysis. AAO points out that standards for an I-924 application with exemplar I-526 are not the same as those that apply to an investor I-526 petition. The USCIS Policy Manual, referencing Matter of Katigbak, says that an application cannot be approved with a different set of facts than those presented in the original filing. But this applies to visa petition proceedings, not applications filed by regional centers. The relevant Policy Manual guidance for regional center amendment applications and the Form 1-924 instructions recognize the evolving business realities that are reflected in regional center amendments, and require an amendment submission only for specific, limited changes. Furthermore, the fact that a change could be material for investor petitions already pending for the same project does not have implications for the exemplar I-526. The Form I-924 eligibility requirements are independent of future eligibility determinations for associated investor petitions. I listened into a Ombudsman’s teleconference on September 6, and heard representatives from USCIS answer questions about the memo. (UPDATE: Here are official notes from the engagement.) The answers indicated that the Office of Policy and Strategy, at least, seems fuzzy on what constitutes “required initial evidence” and “innocent mistakes or misunderstandings.” “Pages left on the copier” was the one example given of an innocent mistake. No examples of innocent misunderstandings – though USCIS clarified that having an attorney or not wouldn’t be a factor. In general, “required initial evidence” means evidence as required by statute, the regulations, and form instructions. But what does it mean specifically? Certainly in EB-5, we see a lot of variation among lawyers and adjudicators in their interpretation of the specific documents required in various situations to satisfy forms and regulations. Now adjudicators will be free to indulge their discretion to interpret requirements, with no chance for response before denial. Meanwhile, lawyers will likely start clogging the system with kitchen sink petitions that throw in every possible document and page in case it’s something that someone might want to see. On the Ombudsman call, USCIS confusingly promised that they would be publishing “optional checklists of required initial evidence”(?) on September 11. If that’s happened for EB-5 yet, I can’t find it. Last year, USCIS published a suggested order of documentation for each EB-5 form, and two distinct sets of filing tips for each form. (These are on a phantom Resources page not linked to menus on the USCIS website.) The specific suggestions are helpful but not applicable to every case, so I hope they won’t end up getting treated as optionalrequired evidence. But who knows what adjudicators make of all this guidance. USCIS told the Ombudsman that adjudicators had received one day of training on the new policy, and may or may not have supervisory review for denials under the new policy. As before, adjudicators are supposed to fully explain the reasons for any denial in the denial notice, and petitioners have the same appeals recourse as before. Anyone not pleased about the August 24 Policy Manual update on Regional Center geographic area will appreciate the points made forcefully by AILA in its Comments on USCIS Policy Manual Guidance on the Geographic Area of Regional Centers (September 9, 2018). AILA dissects the policy itself and the suboptimal process behind it. I realize that my series of timing posts is missing an important piece: analysis of the steps and time factors (for countries with no cut-off date yet) between receiving the Form I-797, Approval Notice for the I-526 and claiming an EB-5 visa number. Especially Indians are trying to calculate: if I can count on receiving I-526 adjudication in the next few weeks, can I count on getting allocated a visa number in the advance of the Visa Bulletin giving a cut-off date for India? The point at which the visa number actually gets allocated, and the factors/timing between I-526 approval and that point, vary between I-485 and consular processing, and I don’t understand it all yet. But potential investors should include this in discussions with counsel, because delays can be considerable for consular processing anyway. I’m hearing reports of USCIS taking at least 3+ months and even 8+ months just to forward I-526 approvals to the National Visa Center. Ironically, it seems that the faster USCIS adjudicates I-526, the more it drags its feet on advancing that approval to the next stage. But this is a developing situation, and I have limited examples. Here is my background reading list so far FYI. Please email me any additional helpful articles and current timing information. USCIS has now made its policy on geographic area amendments an official part of the USCIS Policy Manual. Before, to know the unofficial policy that’s been effective since February 2017, you needed to have been present at a March 2017 stakeholder meeting, noticed followup clarifications on the USCIS website, and been on the email list for a stakeholder alert. Now, at least the policy is set down in the Policy Manual where everyone can find it. As usual, I copied the whole of today’s version of the Policy Manual EB-5 section, and saved it as a Word document in my folder of Policy Manual versions. I then did a document comparison with the previous version (current as of May 15, 2018) to see exactly what changed, and kindly share my redline. In addition to adding language related to geographic amendments, the latest version of the PM clarifies the effective date for tenant occupancy guidance rescision, and specifies that changing regional centers after I-526 filing constitutes a material change. Here is the email from USCIS with links to the Policy Alert and feedback page. The Senate website now has video of of today’s Judiciary Committee hearing on EB-5, as well as a statement from Senator Grassley and written testimony from USCIS Director L. Francis Cissna. I’ve uploaded my recording, and transcribed below the major news from the hearing: that EB-5 regulations are not actually close to being finalized, and the reason is not conspiracy but honest ineptitude. Hanlon’s Razor proves right again. I should’ve known better than to repeat rumors attributing delays to interference. It’s so plausible that, as Cissna says, CIS would be still reviewing public comments, slowed by a complex process and competing demands. I listened to the hearing for hints that anyone plans to do anything about EB-5, and noted few such hints. The Democrats on the committee sent the message that they care about immigration law/policy that hurts children, and can’t be bothered about immigrant investment right now. Most did not even mention EB-5 in their statements or questions, instead changing the subject to undocumented migrants, and the administration’s zero tolerance policy and resulting family separations. Two senators (Feinstein and Durban) called for a kind of action — termination — but didn’t actually talk about EB-5. They discussed a mythical program that allows people to “buy their way to the front of the line” and purchase legal status as a commodity, apparently simply ignorant of basic facts: that EB-5 investors enter the back of a long waiting line with no premium processing option and must put capital at risk but can only acquire status based on job creation, not money. Senator Cornyn was the one person who spoke as if he might still have EB-5 legislation in mind. Senator Grassley granted the necessity of legislation, but complained about how he’d been stymied in the past and focused on calling for regulations (which “can probably do better than legislation”), attacking Director Cissna for not having finalized regs yet. Grassley definitely seemed to be trying to pass the buck on EB-5 program changes from Congress to USCIS. Cissna, meanwhile, tried to pass the buck back, telling the committee that he doubted his department could finalize regs before September 30, and urging Congress to either manage legislative reforms or let the program expire. Meanwhile, it wasn’t clear that anyone present really grasped what’s in the EB-5 modernization regulations, or how the regulations or the last legislative proposal would affect the real world of EB-5. I appreciate that at least Grassley and Cissna tried to do their homework, but clearly still operating with some basic misconceptions that won’t help yield good law or policy. Sigh. So much education remains to be done in EB-5. If our lawmakers and regulators do not know what’s mostly right or what’s actually wrong with EB-5, how can they direct it effectively? On the positive side, Director Cissna’s testimony clarifies that EB-5 does not operate the way it did 25 years ago. The department has made major strides in its efforts to administer the program, particularly in the past couple years. Mr. Cissna reviews operational enhancements that have been implemented, even without reform legislation or regulations. Cissna: It’s not soon enough. I want those regs out as quick as humanly possible. And from the moment I got sworn in back in October, I have been pushing and pushing and pushing for those regs to be completed. There is a process that all regs have to go through, often very lengthy, and I’ve been doing everything I can, from where I sit, since October to ensure those regs get out very fast. Grassley: Are you getting the help of the Secretary? Cissna: Yes. The Secretary is aware of the urgency of this and she is committed to getting the regs– …. Grassley: Do you anticipate the Modernization regulations being finalized before the expiration of the Regional Center program September 30? Cissna: I don’t know. That would be hard to pull off. I think it might be tight. Grassley: Have you or Secretary Nielsen received political pressure from anyone to delay or halt the Modernization regulations? Cissna: No. That I can say with certainty. No one’s been pushing us or telling us to drag our feet or delay this reg in any way. Grassley: If anyone ever does that, will you tell this Committee? Grassley: If the Modernization regulation is not finalized before the expiration of the Regional Center program, do you support letting the program expire? Cissna: I believe that if the program is not fixed in a way that addresses all these problems that we’re going to talk about today then yes, I think that it should expire. Mark your calendars for 10 am EST Tuesday, June 19, when Chairman Grassley will host a Senate Judiciary Committee hearing with the provocative title Citizenship for Sale: Oversight of the EB-5 Investor Visa Program. So far the only announced witness is USCIS Director L. Francis Cissna. As background for the hearing, I recommend my 2015 post Immigrant investor program comparison, which explains how EB-5 fits in the continua of investor visa programs around the world, and the risks and challenges for government oversight inherent in the fact that it’s specifically not a “citizenship for sale” program. The House will reportedly vote next week on immigration legislation: Bob Goodlatte’s H.R. 4760 Securing America’s Future Act, and another to-be-announced bill dealing at minimum with DACA and border security. H.R. 4760 as written would not affect EB-5. (It covers DACA, border security, family reunification, and diversity visas, and proposes reallocating diversity visas to reduce backlogs in EB-1, EB-2, and EB-3 only.) The second bill (available in discussion draft) would affect EB-5 by removing the per-country limit on visa numbers for the EB-5 category. (This would be good news for backlogged China and bad news for all other countries, which would then share the burden of oversubscription equally with China.) In an apparent slight to EB-5, the discussion draft bill would increase total visa numbers for every EB category except EB-5. And a nice email (followed up by another email with qualifications) for people facing long I-829 waits. As a reminder, conditional permanent residents who plan to be outside of the United States for a year or more should apply for a reentry permit by filing Form I-131, Application for Travel Document, before leaving the country. Read more information on our Green Card webpage. USCIS’ California Service Center (CSC) is experiencing a delay in initial data entry for Form I-751, Petition to Remove Conditions on Residence. Since initial data entry has to be completed before a receipt notice can be issued, some petitioners and their dependents may experience a delay in receiving a receipt notice for a Form I-751 submitted to the CSC. If you submitted a Form I-751 to the CSC in May 2018 and you have not received a receipt notice, do not file a duplicate Form I-751 unless you have received a rejection notice or have been instructed to do so by the CSC. The CSC is working to complete data entry of these petitions by the end of June 2018, and will issue another web alert once initial data entry has returned to normal. Petitioners will receive a receipt notice once their data is entered into USCIS systems. If your 2-year green card has expired, you should call the USCIS Contact Center at 1-800-375-5283 (TTY for people with hearing or speech disabilities: 1-800-767-1833). The USCIS Contact Center will setup an appointment for you and any eligible dependents at your local field office. If possible, bring evidence that you sent your Form I-751 via USPS or courier service, such as FedEx. The processing times reports for EB-5 forms were updated on May 31, 2018 with new Estimated Time Ranges and new variables for calculating the Case Inquiry Date. Until this update, the reports had been constant since March 23, 2018. My theory, supported by an informed-sounding blog commenter, is that USCIS recalculated the time ranges based on a dramatic drop in I-526 receipts and dramatic rise in I-829 receipts over the past few months. (The Immigration Data page has not yet been updated with FY2018 Q2 or Q3 data, so I’m not sure.) Alternatively, IPO might have decided to reallocate resources away from I-829 to I-526 adjudication, or the I-526 team might be on fire while the I-829 team struggles with something. Considering the ambiguity (and the fact that the report, however it’s calculated, can evidently suddenly change by six months or more), better not rely on USCIS processing time information for major decision-making. Just one thing is clear: EB-5 petition processing times are too long, and fuel a number of the political and integrity threats that face EB-5 today. The USCIS website has been updated with some additional termination notices for regional centers terminated through May 2017. 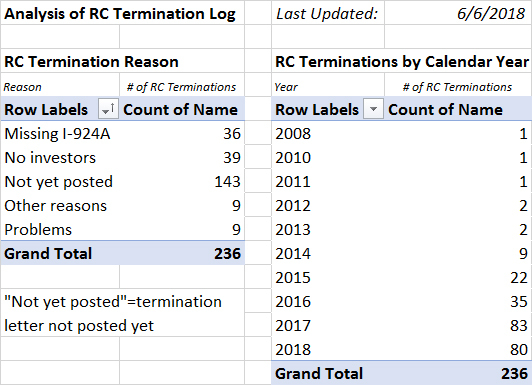 I added the letters to my Termination Log, summarized in the following table. The recent termination letters mainly cite failure to file a Form I-924A annual report and/or inactivity (i.e. no EB-5 investors in the last 3-5 years) as reasons for termination. They rarely mention derogatory evidence as a reason. I used to read between the lines of Senator Grassley’s legislative proposals that he wished to make EB-5 safe, legal, and rare, but now he seems ready to settle for just making it rare. Because the proposed EB-5 regulations (at least, the RIN: 1615-AC07 possibly on schedule to be finalized in August) do not in fact address the integrity or security concerns that the Senator raises in his letters; their major impact would be to dampen demand by increasing investment amounts. I keep watching the OMB website to see when/whether the EB-5 regulations progress to the OMB review stage, but that hasn’t happened yet. Any status changes will be recorded on my Washington Updates page.